NPAN BLOG: Does Expose to the Right Apply at Night? A friend recently asked me if the adage of “Expose to The Right” (ETTR) holds true for night photography. It’s a good question. The answer? Different types of night photography require different exposure strategies. National Parks at Night is a photo workshop program focused on teaching night photography in national parks and other beautiful preserved landscapes. The diverse team of educators includes respected photographers and authors Gabriel Biderman, Tim Cooper, Matt Hill, Lance Keimig, and Chris Nicholson. For astro-landscape photography, try to get the histogram from the left side of the frame—you want just a gap between the left edge and shadow portion of the histogram. You should push the camera to the threshold of its capabilities, so that’s about the best you can hope for. At high ISO, maximum aperture, and with the shutter speed limited by apparent stellar movement, a right-biased histogram is not a reality. Fortunately, an increasing number of cameras can stand up to the high ISOs, like 6400-12800, which this type of work requires. For full-moon exposures shot at near-native ISOs, it’s still a good idea to push the histogram a bit farther to the right. Just be careful not to make it so bright that you cannot bring it back down in post-production. The idea here is to increase image quality by making sure the shadows are as clean as possible without blowing out any highlights. The key to this type of night photography is finding the right balance between ambient and added light. I generally reduce the ambient exposure by 1 to 3 stops, relative to my light painting. Remember that the height of the histogram is irrelevant. It’s how the tonalities extend across the horizontal axis that counts. So, if your shadows are well off the left edge and are rather tall, and your highlights extend almost to the right edge of the histogram, but barely get off the floor, you are doing it right. 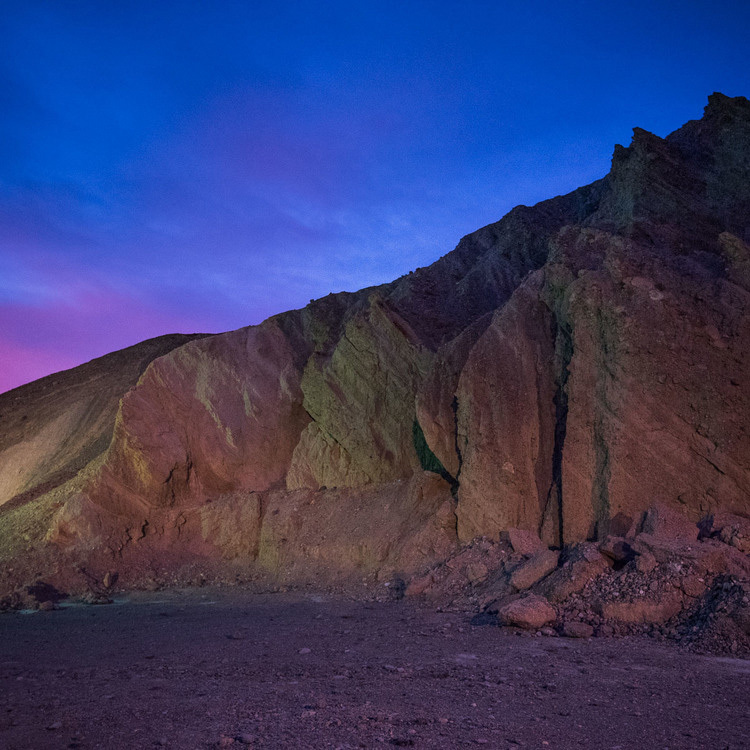 In this image from Death Valley National Park, the night accounts for much of the left half of the histogram (below), and the light-painted rock face and foreground account for much of the right half. With urban night photography, the best approach is to give an image as much exposure as possible without clipping important highlight detail, by using the blinking highlight indicator, rather than the histogram. Newer cameras—especially ones like the Nikon D750—do a great job at controlling noise when you bring up the exposure in an underexposed image. This technique didn’t work with older cameras. The key to successful urban night photography is to determine which highlights are important and which ones to sacrifice. Generally, light sources in the frame should be allowed to clip, but not to blossom out past the edge of the light itself. Flat surfaces like walls or the ground should not be clipped, as it is important to retain detail in these areas most of the time. It’s not necessary to have a big hump on the right side of the histogram—just a long, flat tail that extends almost to the right edge is fine. The goal is to take advantage of the part of the sensor’s dynamic rage which has the greatest concentration of tonality: the highlights on the right side of the histogram! National Parks at Night’s upcoming workshop locations include Dry Tortugas, in Florida; Olympic, in Washington; and the Eastern Sierra, in California. To grab one of the few remaining spots, visit National Parks at Night. LANCE KEIMIG Night Photography has been Keimig’s passion since he was first handed a camera 30 years ago. From the first rolls of film that he ever shot, he has been fascinated with the way that time can be expressed and distorted with long exposure photography. The ability to make images that record time differently than the way we perceive it with our eyes has held his attention for all this time. Keimig moved to San Francisco to study with legendary Bay Area night photographer Steve Harper, where he learned not only about night photography, but about what it meant to be a great teacher. His classes were all about sharing ideas. There was no competition, no rivalry, and the students and instructor all worked and learned together in the most supportive and friendly environment he has ever experienced. Before I started my "Full Moon" project, I researched exposure suggesstions for moon photography.I found the "Sunny 16" rule was used for full moon photography: set the f/stop to f/16, the shutter speed to one over the ISO. The camera that I used for the project, a Canon A-1, doesn't have a histogram. I had to wait to get the film developed. I did do bracketing shooting one under and one over. Since I was shooting B&W film, I also used B&W contrast filters, yellow, orange, and red and compensated for their filter factors on my 80-205mm lens; I also used my 400mm lens. It was a total of 12 frames per moon rise and moon set. Towards the end of the year long project, I learned about the "Looney 11" rule, which is the same as the "Sunny 16" rule, but using f/11. Thanks for being our biggest reader!